It's Wabbit Season..... Stuffed Wabbits to Be Precise! | Life Love and Hiccups: It's Wabbit Season..... Stuffed Wabbits to Be Precise! It's Wabbit Season..... Stuffed Wabbits to Be Precise! Is it just me or does the recovery time one gets between Christmas and Easter seem to be shrinking? It's March already and Easter is making an early appearance at the end of this month. Now it's no secret that I love me a good excuse to get all crafty and creative and Christmas, Easter and Birthdays along with all the other celebrations give me an open license to go nuts. The kids get excited too as they generally get to reap the rewards of my overstimulated crafting and cooking mojo. Good Friday this year just so happens to be the first day AFTER my 6 week diet finishes so I am completely fixated on the idea of me sitting at the dinner table, bib on, smashing into a pile of crabs and prawns (as is the tradition on Good Friday in our house). I am hoping that in the meantime, that crab smashing image I have in my mind is enough to distract me from all the brightly coloured chocolate eggs that are teasing me every where I look. And so the build up to Easter begins. What??? Come on a month is not too early when there is such a lot to do. My Easter board on Pinterest is straining under the weight of all the gorgeous ideas and images I am desperate to try out. 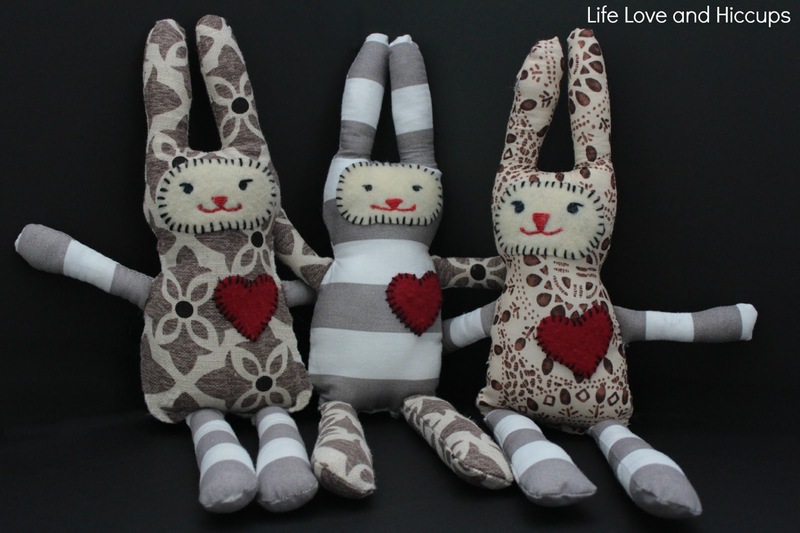 At least I can cross one project off the list - some little stuffed bunnies. Little stuffed bunnies sound awful don't they? It conjures up images of me wabbit hunting and then hanging out in a mangy old wooden cabin playing at taxidermy. I assure you no rabbits were harmed in the making of this post or this project. 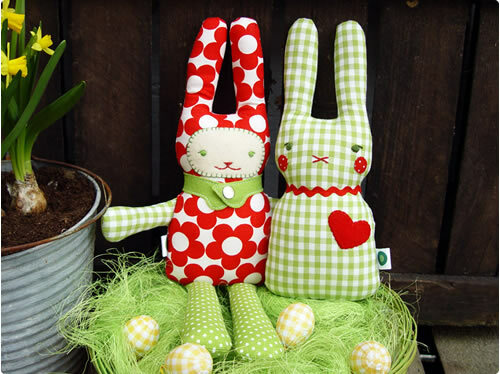 When I talk about little stuffed bunnies, I am actually referring to these cute little fabric rabbits. When I saw those on Pinterest I felt insanely compelled to make some of these for my boys. The problem is when I get these crazy ideas to attempt projects that are so far above my skill set, that I have to make 3 of everything and in this case I had to put together 3 of the little stuffed buggers. Just so we are clear, that is 3 times the chance of me going completely and utterly insane. As I mentioned in yesterday's post I have been cranky and moody this week as a result of this diet, so the rainy weekend was actually brilliant timing in that I could tuck myself away in my lady cave sewing and stuffing and generally keeping out of everyone's way. I do distinctively recall sitting in my study muttering to myself "Never Ever Again" as I stabbed the stuffing into tiny little openings of the arms and legs on those little bunnies. I may even have been manically laughing to myself as I wrestled with the sewing machine, fiddling with the attachment of those arms and legs to the rabbit's body. But in hindsight, I kind of liken this exercise to childbirth, in that as I watched the delight on my kids faces as I handed over those little stuffed rabbist, all memories of the pain and suffering I had just endured seemed to simply disappear into nothing. Now I cannot take any credit for the idea of these cute little rabbits. I found the pattern over at RevoluzZa after I stumbled across a picture on Pinterest. So if you are interested in making them for yourself - click here to head over there for the pattern. 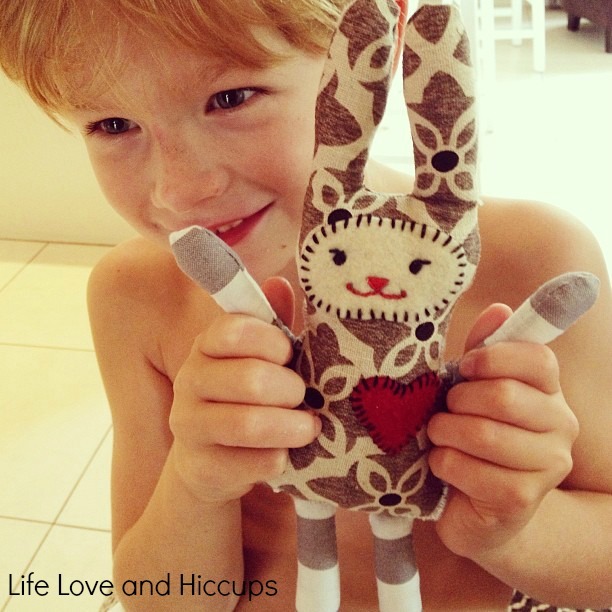 RevoluzZa is a gorgeous German blog that has the most amazing patterns and tutorials for the cutest stuffed toys. As per usual there will be numerous posts as I work on the preparations for Easter in our home - hey a girls gotta blog about something right? Oh and there are a few gorgeous Easter Giveaways heading your way too, so stay tuned. Has the Easter countdown begun in your household? Have you been madly repinning all those gorgeous images that are appearing on Pinterest?